Copyright © 2018 The Brunswick Beacon, your source for local news, sports, events and information in Brunswick County, North Carolina and surrounding areas. 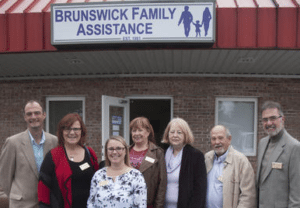 Tuesday, January 30, 2018 – LELAND — Brunswick Family Assistance has opened a second full-time office to assist individuals and families in crisis in northern Brunswick County. The new office in the Leland Business Center at 324-I Village Road behind the new Domino’s Pizza opened quietly Jan. 16 to begin volunteer training, but hosted an official opening Jan. 29 announcing services are available five days a week. BFA’s Leland office hours are Mondays through Thursdays, 9 a.m. to noon and 1 to 4:30pm, and on Fridays 9 a.m. to noon and 1 to 3 p.m.
BFA is a nonprofit that offers financial assistance, rental assistance, job skills training and financial literacy classes at the Shallotte headquarters and Leland office. The group has also operated a food pantry and organizes Christmas gift and commodities distributions out of Shallotte for recipients countywide. The Shallotte office is in Twin Creek Plaza at Smith Avenue and Main Street. BFA expanded its services in the northern part of the county one day a week beginning in 2016 to aiding low-income residents with utility and rent assistance. It increased to twice a week last year. BFA executive director Stephanie Bowen spoke to Brunswick County commissioners at their Oct. 2, 2017, meeting to give them early notice that her agency’s 2018-19 budget would seek $25,000 more to expand services in Leland. The Brunswick County 2017-18 budget provides $125,000 to BFA. County staff didn’t wait for the new fiscal year and board members voted in the Nov. 16 meeting’s consent agenda to provide BFA with $15,000 to expand services in the Leland area. 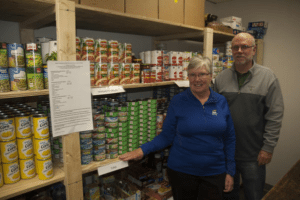 The expansion allowed BFA to add a food pantry at the Leland office along with the weekday hours. Bowen said BFA provided more than $67,000 in assistance to clients in northern Brunswick County’s 28451 ZIP code last year. “While we’re glad that we’re able to provide that assistance, obviously it shows a huge need and a huge population of people living below the poverty line,” she said. “Our only food pantry was 30 miles away before, so folks who are living in poverty, what we know about them is that they don’t have transportation or gas money to get to Shallotte and so (now) they have a food pantry right here in their neighborhood that they can come to that’s open five days a week. Bowen added that many Shallotte area volunteers have made the trip to Leland to help staff the new office, but they are working on increasing the number of northern Brunswick County volunteers. The Leland office also accepts food donations. Bowen said plastic grocery bags are needed, too, to reuse to distribute food from the pantry. Brian Slattery is a staff writer for the Beacon. Reach him at 754-6890 or bslattery@brunswickbeacon.com.